Big Dogs Sportswear, online at BigDogs.com, sells an array of graphic tees, rayon shirts, and shorts. At Big Dogs Sportswear, you can find island casual rayon shirts, graphic t-shirts, boxers, polo shirts, and plaid shirts. You can also find polar fleece tops, lounge shorts, lounge pants, long-sleeve t-shirts, tees with logos, denim shorts, cargo shorts, and crew neck shirts. RetailSteal.com has the best Big Dogs Sportswear coupon codes, Big Dogs Sportswear discounts, Big Dogs Sportswear coupons, and Big Dogs Sportswear promo codes. Shipping and handling rates at Big Dogs Sportswear depend on the pricing of your purchase and your shipping destination. See website for full details. Exclusions may apply. Shop the sale section at BigDogs.com and enjoy up to 75% off a wide range of apparel and accessories. Shop at BigDogs.com and get free shipping on orders of $50 or more. Click link for savings. Take advantage of buy one get one 50% off savings store wide at Big Dogs. Click to enjoy limited time savings. Don't miss out on the weekly deals at Big Dogs! Hurry over today and save up to 75% on merchandise. Shop the men's sale and save up to 75% on apparel. Click to shop. Right now at BigDogs.com, save up to 40% on select hoodies and fleece. Click link to shop. 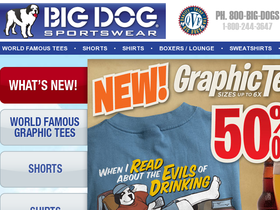 Head over to Big Dog Sportswear today and get 2 adult tees on sale for only $20. Click to shop. At Big Dogs, you can buy two boys or girls tees for only $20. Click here to shop. Buy Big Dogs Graphic T-Shirts two for $30 plus get free shipping at BigDogs.com. Click link to shop.